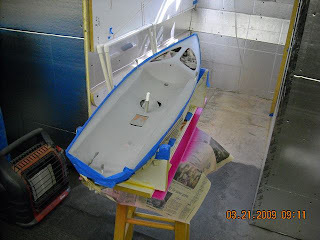 After the clear coat on the hull set, I taped up the edge of the hull/deck so I could spray the white paint on the deck. You will note 'plugs' in the predrilled holes for the shroud attachement, backstay and turning block, also a plug in the mainsheet tube. This is to prevent excess paint from getting into these holes. I used a blow dryer to help the paint dry between coats of white paint. 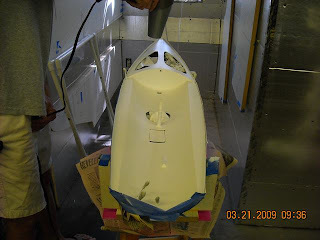 I put on about 6 coats of white paint, it covered the grey primer real even. 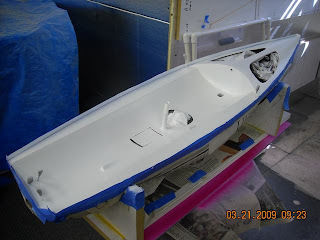 Here is the hull with 6 coats of white and the tape still on.